Modern in design and impact, this Spanish floral cotton print pops with a rainbow of vibrant color. Those background colors stream and swirl accenting four large O’Keefe-like flowers. 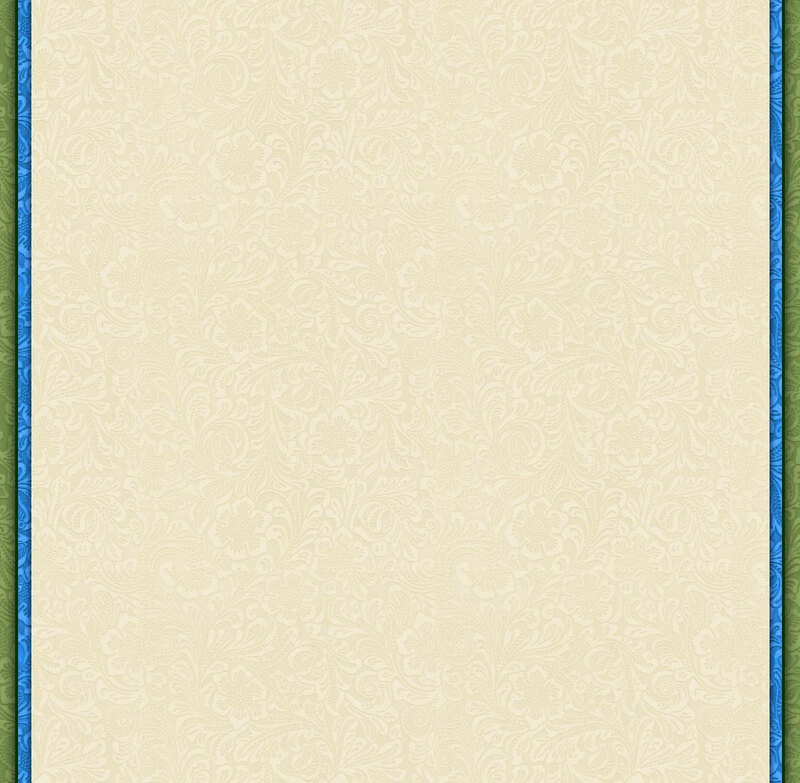 A ¼ inch hand rolled black border completes a portrait worthy of framing! For lovers of purple and lavender, our contemporary Spanish cotton orchid print is a must! Measuring 14” x 14”, this little gem boasts four magnificently colored orchids resting on a swirling field of complimentary colors accented with a 1/2” purple border and a hand rolled edge. Tropical flora and fauna accent this 14"x 14" Spanish print. 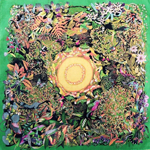 At its center blazes a tropical sun surrounded by multi-colored birds and butterflies, exotic flowers and ferns and monkeys swinging from trees. What a splash of color for a perfect fashion accessory! 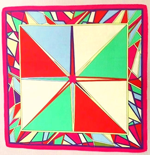 A hot pink star is ablaze at the center of this colorful cotton hand screened Italian geometrical print surrounded by 8 large multi-colored triangles with a 1 ½” rainbow border of modern art shapes and a colorful hand rolled border. This modern print resembles a dazzling stain glassed window-a perfect fashion accessory for today! 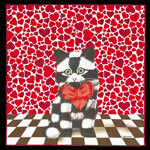 New from Italy, an exciting 14”x 14” cotton print that pops! Resting on a blue cotton background the zigzag pattern is composed of multiple colors: red, fuchsia, pink, lavender, orange, teal, white, purple and black. With a distinctive hand rolled edge, this handkerchief is modern , uplifting, and smashing. What an accessory! A striking Spanish cotton print handkerchief featuring 9 stately horses beautifully decorated with beads, bangles, tassels and ornate jewels. 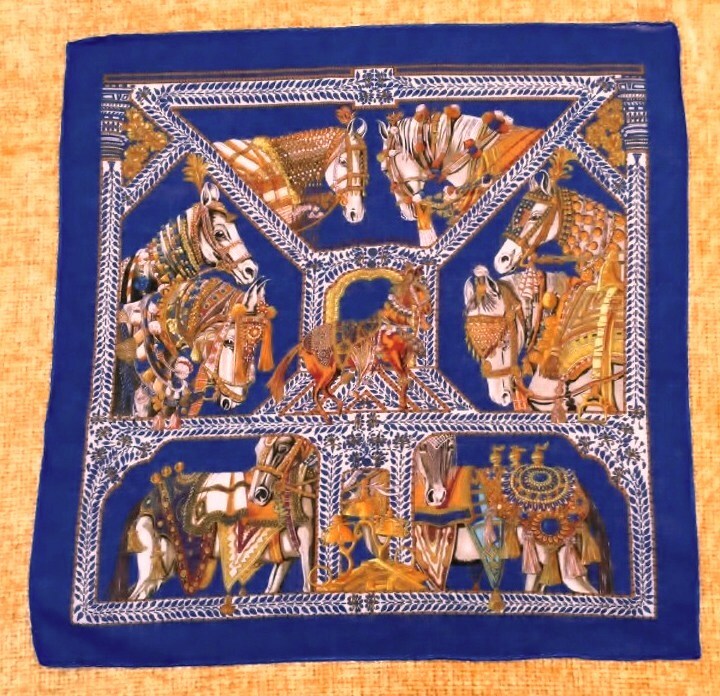 Measuring 13 ½” square, the bejeweled horses rest upon a royal blue background complete with a hand-rolled edge. 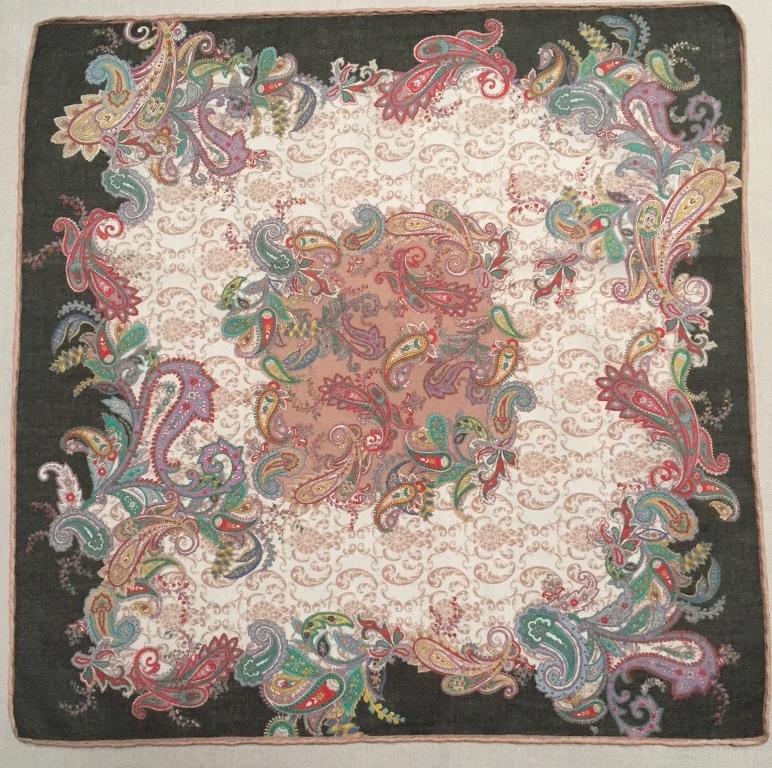 Resting on an eggshell background filled with feather-like swirls of paisley, this is a lovely soft Spanish cotton print 13 inches square featuring a dark green border with multiple colored paisley images complete with a hand-rolled taupe hem. Simply beautiful! 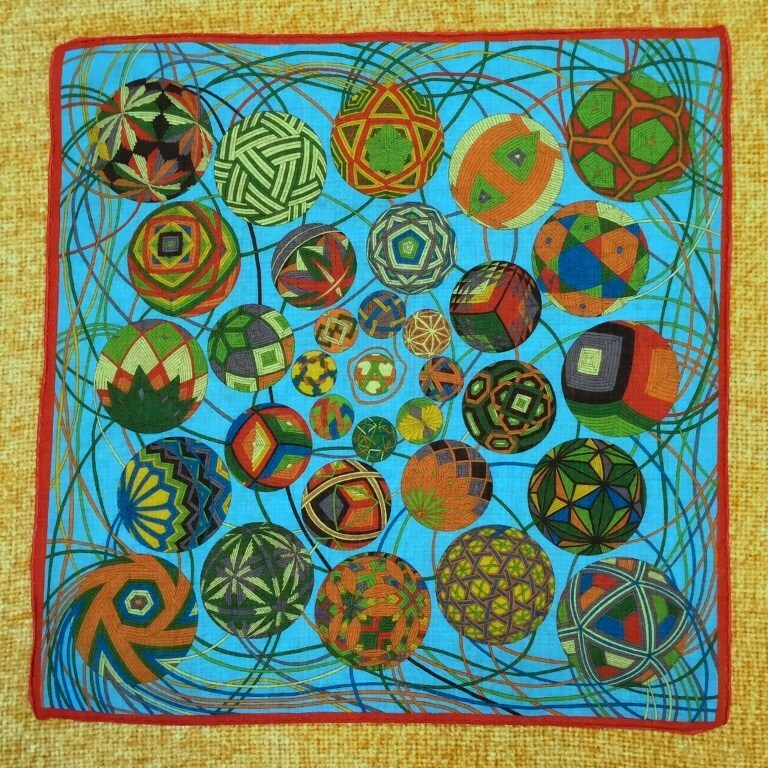 A vibrant Spanish cotton print comprised of 36 multi-colored balls of yarn strung together by thin lines of color connecting geometric spheres. This dazzling 13 ½” x 13 ½ “ rests on a turquoise background with a striding ¼” burnt orange hand-rolled border. Spectacular! 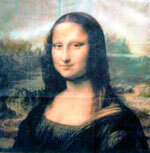 One of the most recognizable faces on the planet, Leonardo da Vinci’s Mona Lisa graces this exquisite all cotton handkerchief made in Italy. 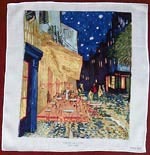 The handkerchief measures 13 ½ “ X 13 ½” and is suitable for any outfit, for any occasion, or for placement in a glass frame! The original portrait speaks for itself, and this beautiful cotton creation is a little masterpiece. 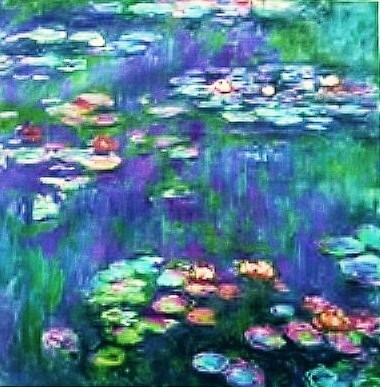 Highly recognizable, Monet’s Water Lilies is a quintessential example of the artist’s impressionistic work. Made in Italy, the all-cotton, hand rolled creation is a little masterpiece. 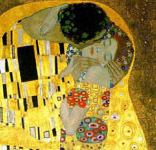 Gustav Klimt captures romance, beauty and passion in his familiar painting, “The Kiss” brought to life on this magnificent 13 ½” X 13 ½ “ Italian cotton print handkerchief. A perfect accessory for a garden party, your little black purse, or that suit pocket near your lapel when just want to stand out in crowd! Reminiscent of Keat’s lovers frozen in time on that famous Grecian urn, this colorful work of art reminds us that “A Thing of Beauty is a Joy Forever”! 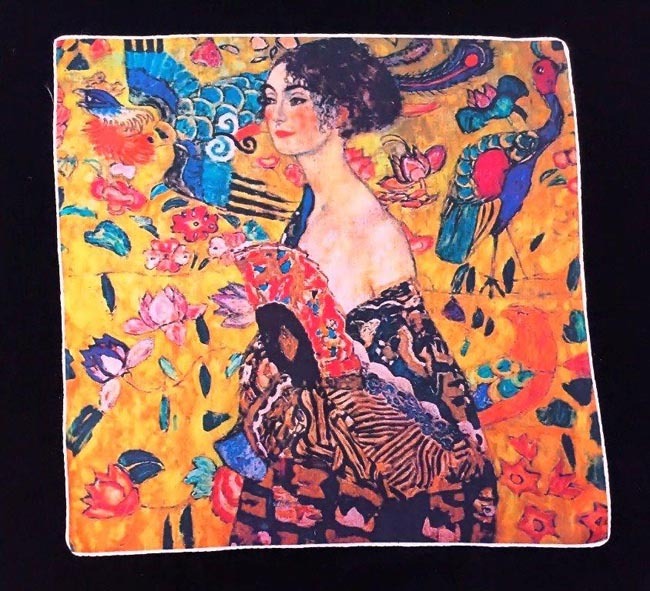 An exceptional Italian cotton printed handkerchief, Klimt’s Lady With Fan displays sharp vivid images and a palette of intense colors. The female figure dominates while the colors in her fan are reproduced and expanded through avian and floral images that celebrate Klimt’s artistic genius. Hand rolled and fabulous! 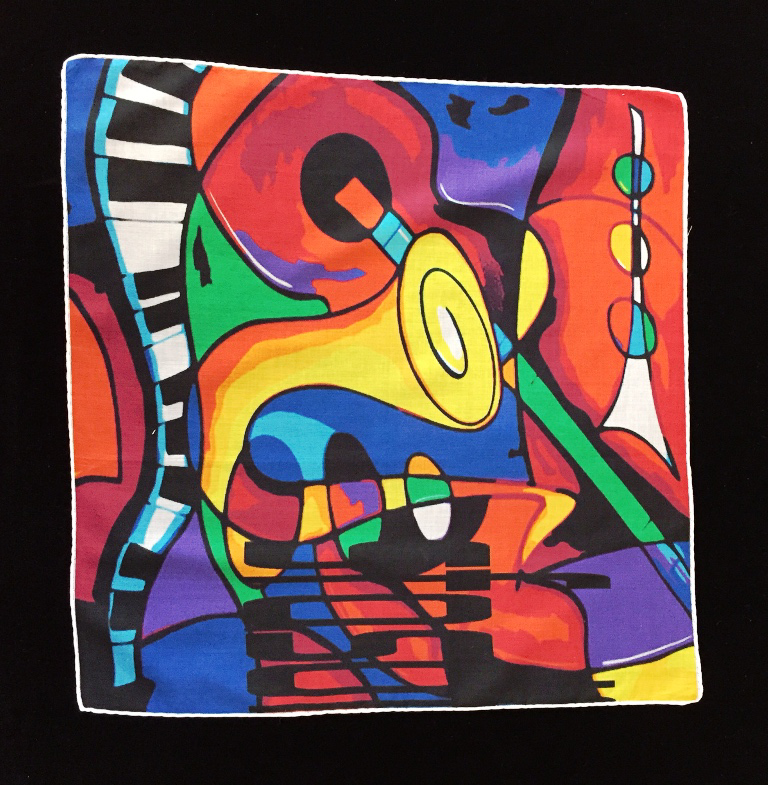 World famous Picasso’s Abstract Music is the subject of this exceptionally fine 14 inch Italian cotton print handkerchief. If you listen, you can almost hear the piano, horn and string instruments celebrating the rich colors and artistry of one of the world’s outstanding artists. Add to your collection of distinctive accessories. 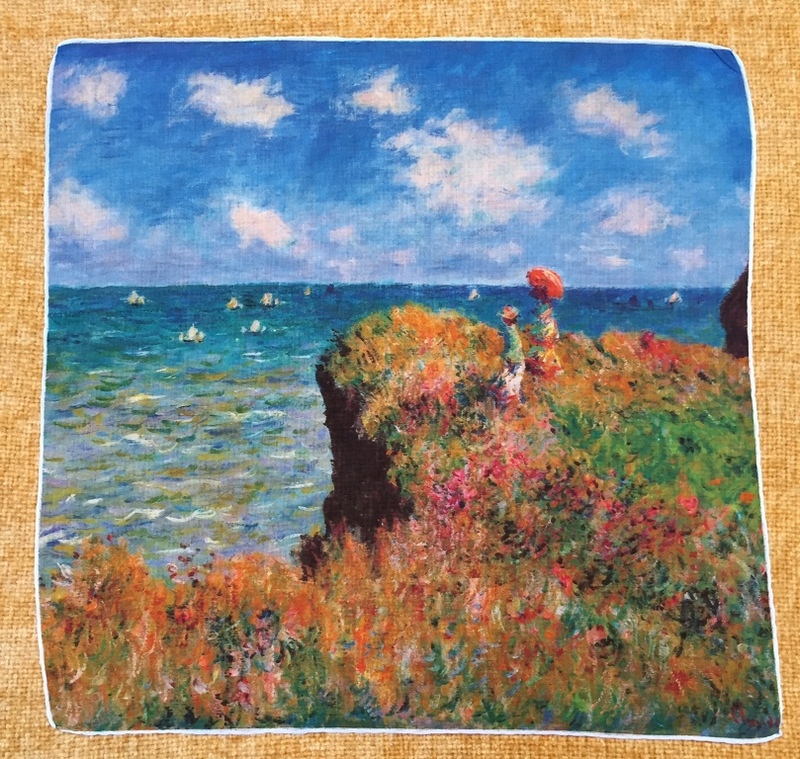 A new addition to our great artists’ series, Cliff Walk at Pourville is the work of Claude Monet, brilliant French Impressionist. What a perfectly gorgeous transfer from canvas to this 14” square Italian cotton hand rolled handkerchief featuring two women on a cliff alive with a palette of fiery oranges, greens, reds, yellows and blue overlooking a cloud-filled sky of blue, white, pink and lavender above a wave- filled sea of turquoise with tiny white ships afloat. A thing of beauty is a joy forever! Magnificent! 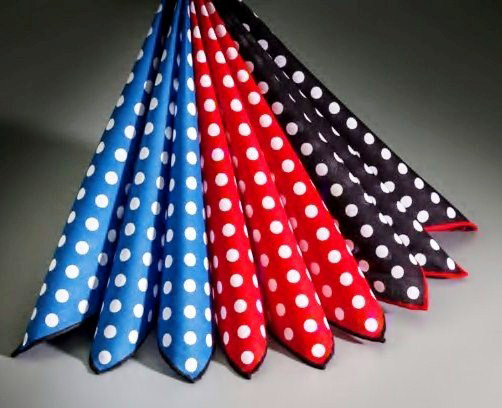 Popping polka dots to perk up your wardrobe. Available in three fashion right color combos: (A) Sky Blue, (B) Fire Engine Red and (C) Midnight Black. With hundreds of white polka dots adorning colorful fine Swiss cotton, these 12” squares all boast color coordinated hand rolled hems. The perfect Fashionista accessory! 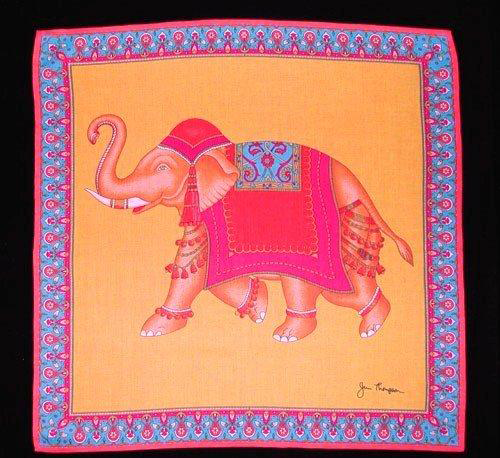 Direct from the artistic etchings of Jim Thompson, our magnificent Royal Elephant handkerchief is a 16 ” square bejeweled beauty. From Thailand, this ornate elephant in motion is richly embellished with bells and trinkets and a tassel hanging from a multi-colored head covering that complements a vibrant body blanket of teal and bronze. Royal Elephant rests on a Golden Persimmon background and the entire figure is framed with a 1 ½ ” outer border of teal, rust , red, and a hand-finished burnt orange edge. Best of all, this elegant Thai treasure, suitable for framing, greets the viewer with a symbol of good luck: a raised trunk. A truly beautiful fashion accent accessory. 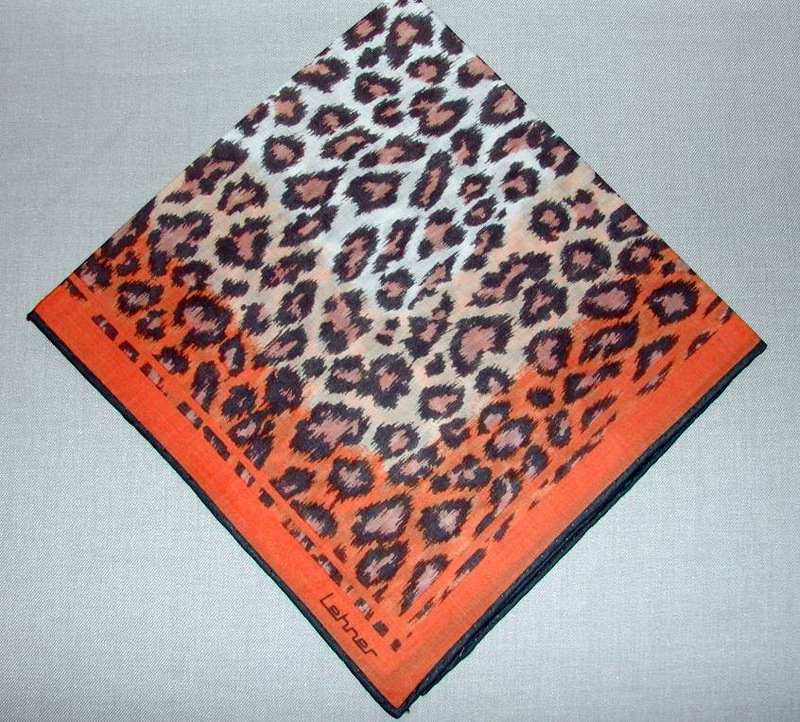 Beautifully understated, this all-cotton Swiss leopard print measures 14” x 14” and is the perfect accessory. Hand-rolled, this classic call of the wild print has the recognized Lehner signature and lends itself to adding a splash of color to casual attire or to enhancing any outfit. Stunning! Direct from Spain, our Call of the Wild cotton print measures 14”x 14” and is beautifully hand rolled. 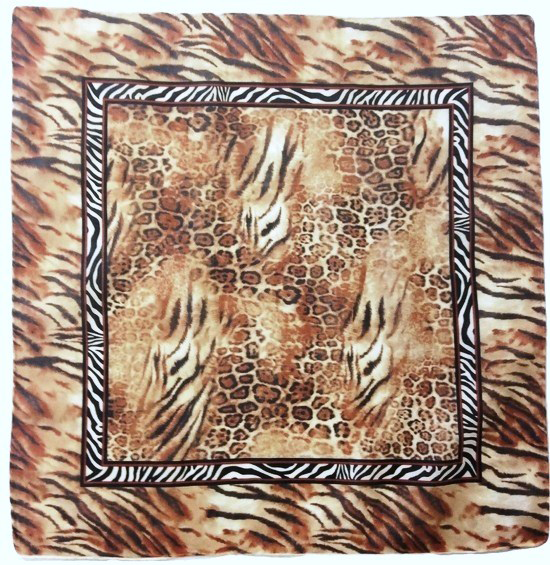 An amazing pattern of leopard spots and tiger and zebra stripes accent this striking jungle print fashion accessory. Too beautiful for words perfectly suits this magnificent new cotton print ablaze with vibrant red poppies tinged with burnt orange resting on a cotton field of graduated orange and sunflower yellow. Measuring 14” x 14” this Swiss creation is complete with a poppy red pencil thin hand rolled hem. Stunning! A stylish delicate and romantic fresh modern print blends pink and lavender flowers floating on a field of superb white Swiss cotton. 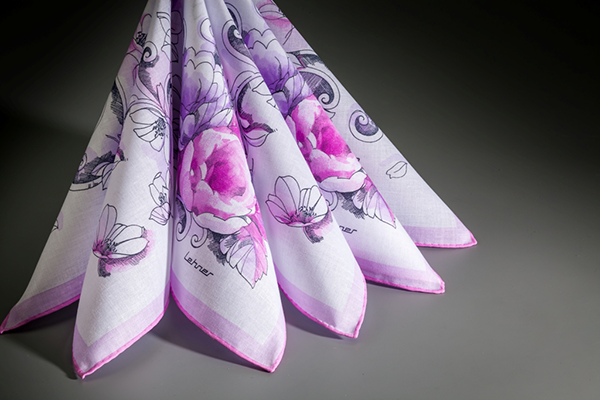 Measuring 14” x 14”, the handkerchief is complete with a complimentary hand -rolled pink edge. Beautiful! I’m just a cat who can’t say “NO”! I need a good home and am sure to please any stylish gal willing to carry me around. I am in need of companionship! Please! Please! Please! send for me now while I’m still available! 100% cotton, 14” x14”, made in Switzerland. Purrfect! 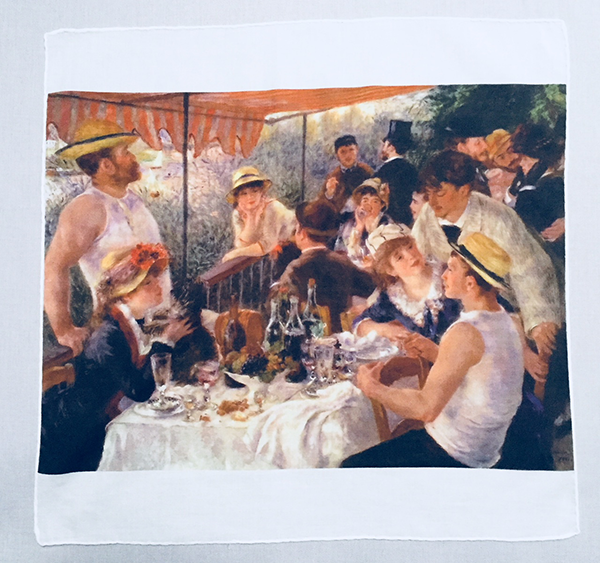 From our Great Maters Collection, a luxurious cotton handkerchief featuring Renoir’s exquisite Impressionist work entitled “Luncheon of the Boating Party”. Superbly crafted in Italy with a hand rolled hem. 13 Inch - Vincent Van Gogh. The Great Masters Collection. Made in Switzerland and hand rolled. 13 Inch - Toulouse Lautrec. The Great Masters Collection. Made in Switzerland and hand rolled. 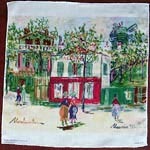 13 Inch - Maurice Utrillo. The Great Masters Collection. Made in Switzerland and hand rolled. 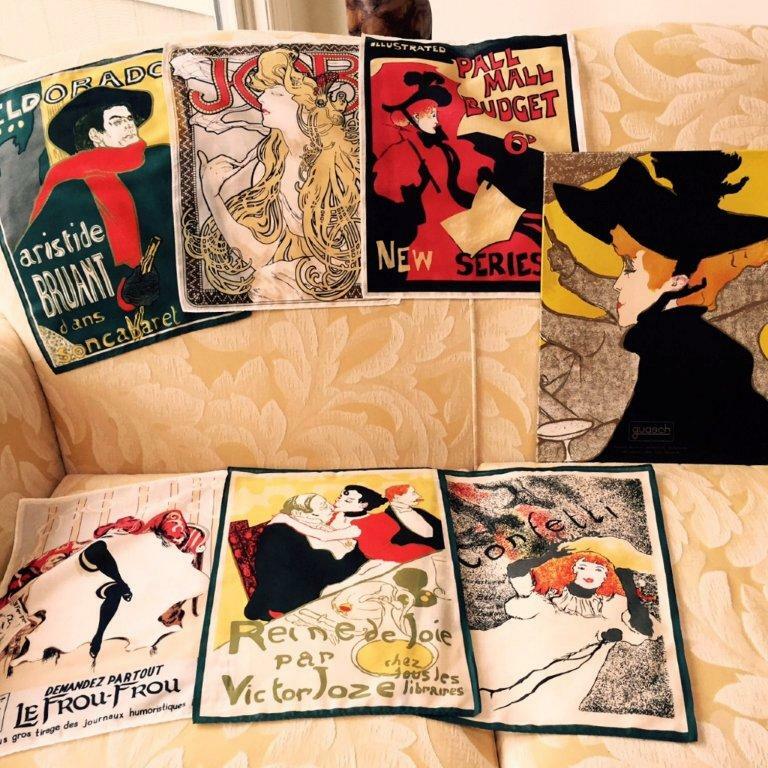 From the artistry of Toulouse Lautrec and Alphonse Mucha we offer an exceptionally beautiful and unique set of 6 rectangular handkerchief prints based on famous French posters. Each measuring 11 ½” x15 ½”, the 100% Spanish cotton collection includes assorted familiar images from well -known French vintage posters. Vividly portrayed, each print is suitable for framing or for use . 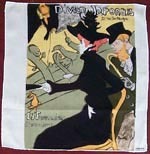 The set of 6 prints comes in a magnificent box featuring Lautrec’s famous Divan Japonais , the Lady in Black. The box itself has become a collector’s item! Sold only as a set. Very limited quantities. Patterns vary.